If you’re interested in becoming part of a vibrant, diverse LGBT community, why not join us? We rehearse every Tuesday evening in Bristol City Centre, from 7.30pm to 9.30 pm (7pm in the run-up to major performances. As a community group, we don't audition - anyone is able to join, regardless of experience or ability, and we use a variety of methods to learn new material; you don't have to be able to read music. We have a wide repertoire, singing pieces from a multitude of genres and we welcome song ideas from choir members. We also meet socially – the choir provides a social network for those who want an alternative to the bar scene, and people quickly form friendships that extend beyond the rehearsal space. We have a social team who organise official events but there are also many smaller events organised within the membership. just before we close the ability to sign up to the annual concert in January. You're also welcome to come along to one of these evenings to check us out and see what all the fuss is about! initially, all of the potential new members meet representatives of the main committee in our rehearsal venue before the rest of the choir arrives, giving an opportunity to learn about the structure of the choir, ask any questions, and meet some of the people who help administrate the choir. next, the whole choir will perform a few songs from our recent repertoire, demonstrating what we do together – in short, we audition for you! finally, we'll learn something new together to give a taste of how we rehearse as a group. Most community groups and choirs charge a subscription fee. At Sing Out Bristol we give new members two free rehearsals (in addition to the new members evening) to decide whether the choir is really for them. *This fee cover up to 3 weekend workshops throughout the year and additional sectional rehearsalsIf you are unable to meet this financial commitment, we'd be happy to discuss other arrangements with you..
To find out more or to book your place at our next new members' evening, email us by clicking below (link opens a pre-populated template, you just need to add your name at the bottom - feel free to add your own message, if you wish). Now is a great time to join Sing Out Bristol as a new trustee. We recently celebrated our 10 year anniversary and we're now into our next exciting decade. 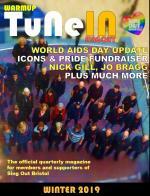 Sing Out Bristol is the south-west’s award-winning Lesbian, Gay, Bisexual and Transgender (LGBT+) Community Choir. By joining our Management Committee you’ll actively help us keep serving the LBGT+ community and building bridges with others. We are looking for resourceful, determined and committed trustees to join our great organisation. The Management Committee are the charity trustees – they are responsible for directing, shaping and developing the organisation, alongside an impressive team of volunteers and music directors. • The desire to give something back, volunteering time, skills and knowledge to Sing Out Bristol. Sing Out Bristol is a registered charity (number 1152673), with 120+ members, an annual turnover of around £30,000, many volunteers, no employees and a few contracted suppliers. Trustee roles are voluntary (not remunerated), although some reasonable expenses will be reimbursed. Joining our management committee will be a highly rewarding role and you will have the opportunity to make a real difference. The appointment will be for two years. Meetings are held at least 6 times a year and there is opportunity to be involved in many rewarding projects. Sing Out Bristol is committed to equality of opportunity for all. Diversity is important to us and we welcome nominations from individuals regardless of their race, ethnicity, sexual orientation, religion, age, gender or disability status. The management committee is responsible for the governance of the choir and charity. It typically comprises two co-chairs of differing gender identity, a secretary, a treasurer, a communications coordinator, a membership secretary, an outreach coordinator and a number of general trustees, up to a total membership of twelve. Alongside governance, the choir’s main activities are coordinated by an impressive creative team. Led by our skilled music director, the team of volunteers achieves an annual concert, many smaller performances, Little Sing Out (our rent-a-choir), development and choralography workshops, social events and much more. If you consider yourself as a fan of Sing Out Bristol, why not make it official by registering as a supporter! It's completely free to join our Friends of Sing Out Bristol mailing list, which gives you priority booking of tickets for our annual concert and other events. Plus, you'll receive a quarterly online magazine for supporters and members of the choir, featuring photos, videos and news and gossip from within the choir as well as features and interviews with members. Enter your email address below to sign up to the mailing list.